Meet the Patels is an award-winning crowdpleaser real life romantic comedy documentary that has turned a family project into one of the most-talked about movies of the year. Following its successful opening in New York, Los Angeles, and Chicago which included many sold out shows, MEET THE PATELS now releases in new markets nationwide this Friday, September 18, including New Jersey, North Carolina, DC, Boston, Philadelphia, Tampa, and Detroit. 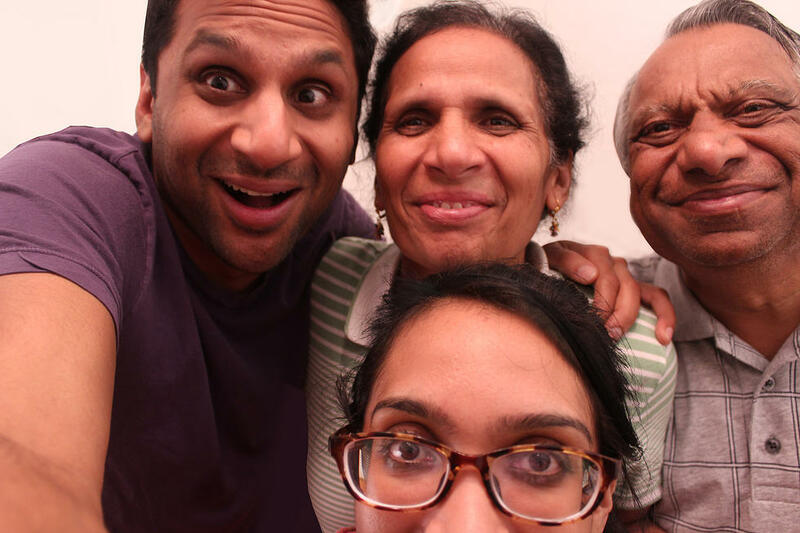 Vasant and Champa Patel, parents of co-directors Geeta and Ravi Patel, completely stole the show in the film and we loved them! They sat down for this exclusive interview to talk about their new fame and their filmmaking kids. When did Ravi and Geeta first show signs that they wanted to go into filmmaking and the arts? Dad: Ravi has always been our family clown. Always performing, since he was a kid. I can show you some funny home videos! Mom: Ever since he was little, he would dance and sing and make us laugh. What was it like having a camera team follow you around during the time of the shooting? Dad: Geeta was the only person filming us, and we were used to it. She was always doing art projects. We were so surprised when we saw the film. Mom: I was like, “Oh My God!” It was such a great film. I was so proud of my babies. As directors, did your kids enjoy being your “boss” on the set? Dad: Haha! With Patels, we never have a boss. Geeta and Ravi had to put up with our opinions too. We had a great time. Mom: They just filmed what we did all the day. What you see on the screen is our real life! I wish I knew it was going to be a big movie. I would have worn better clothes! Have other families asked you to help with matchmaking after seeing you in this film? Dad: Oh yes, Champa (mom) is the best. People have been coming up to her for a year now! Mom: I love it. We have some matches happening right now. Let’s see how they go! What future films would you yourselves like to be in? Dad: We love films about family and love. 16 queries in 1.289 seconds.